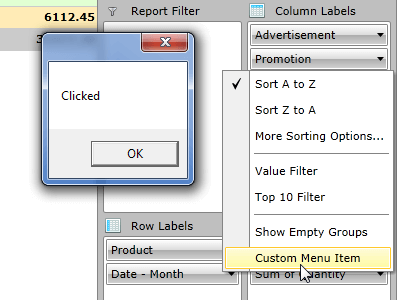 All of the context menus that appear in the PivotFieldList are generated by its FieldListContextMenuBehavior. The PivotFieldList provides the option to inherit and modify its default FieldListContextMenuBehavior in order to implement custom context menu functionality by adding or removing MenuItems. You can use exactly the same approach in order to modify the context menu of the other description types. You will need to check whether the dataContext object is a type of the desired group descripton (for example DoubleGroupDescription or AggregateDescriptionBase) and implement the required functionality. You can download a runnable project which demonstrates more complex example from our online SDK repository here, the example is listed as PivotGrid / CustomContextMenuBehavior.